Since it is football time in Tennessee, here is a photo that you may not have seen. This is from the Student Body Field Day, March 18, 1921. The students actually came out to level the field and clear it of rocks. Though it has been made over several times, it is still the same field. The surroundings have changed a bit. See if you can spot what still remains from this picture. Scroll down to see the answer. If you answered the west stands, Ayres Hall, South College, and Estabrook Hall, you are correct. 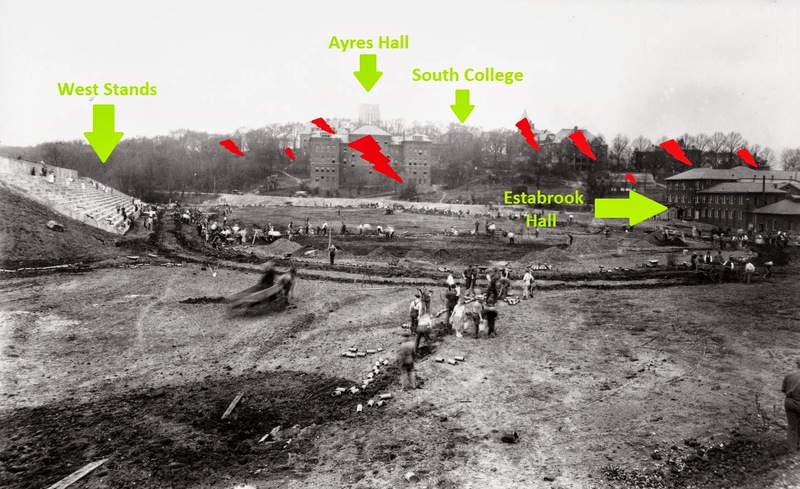 For what it is worth, Estabrook Hall (the second oldest academic building on campus) may not be with us much longer.